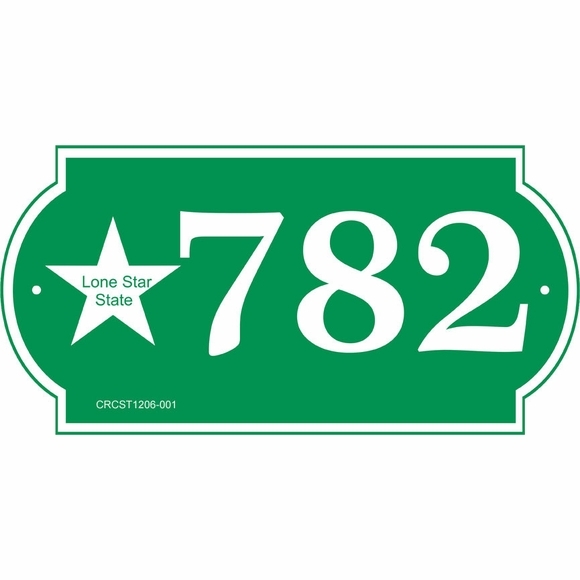 Personalized Texas Lone Star State Address Plaque - - one line address sign displays the Texas Lone Star State logo on the left and your house number on the right. Made in USA. 12" x 6" wall mount custom made with your address number and color selection. Decorative enhanced rectangle shape. Holds three (3) large 3.5" numbers (or short name or initials) on one line. Note: the style number you see on the sample signs is for internal use only and is not engraved into your custom sign. Characters and border are permanently engraved into the sign during the production process. Seven vivid color combinations: sky blue with white characters; black with white characters; white with black characters; brushed gold with black characters; brushed stainless with black characters; and kelley green with white characters; red with white characters; and yellow with black characters. Thin border stripe is the same color as the personalization and accentuates the enhanced rectangle shape. Comes with two 3/16" diameter fastener holes and stainless steel mounting screws. Dimensions: 12"W x 6"H x 1/8". Personalized Lone Star State address number sign made in the USA by skilled artisans to assure the highest quality. If you are looking for a state theme address sign for any other state, please contact us for a quotation.